I don't think I've ever heard a negative word directed at Mark Twain's The Adventures of Huckleberry Finn, and quite frankly, I can't find anything negative to say about it either. There's nothing really wrong with it. It entertains readers with comical, lighthearted moments, but by the time one finishes the book, Huck Finn's adventures of fleeing his hometown with Jim, a runaway slave, are bound to leave a meaningful impact on the reader. Sure, I'll admit, the writing style could be a bit tricky to understand due to Twain's ability to accurately scribe what the English dialect sounded like at the time, but it puts a clear picture into one's head. The type of writing of a novel has a huge impact on how emotion is thrust upon the reader, and the innocent, real-life approach to Huck's story helped get any emotions across in just the right manner. I mean, how can someone not feel anything when reading this coming-of-age novel that demonstrates the wretched racism of the time? As Huck and Jim travel, Huck has to figure out what kind of person he is and what he really believes in, even if it does go against the status quo of that time period. His inevitable realization that he didn't care if he was going to hell, that he couldn't betray Jim and give into the corrupted laws of humanity... That was the best part of it for me. I shed a tear or two. Jim and Huck's father-son relationship really tugged at my heart strings from time to time. Apart from their relationship, I just felt so sad for Jim. But don't get the idea that this book will cause emotional turmoil, because as I previously mentioned, there are comical moments, oftentimes with Tom Sawyer. However, Tom drove me crazy with his need to make everything a complicated adventure, but everything that annoyed me made him a more interesting character. Still, I did like Huck, and couldn't help but feel sympathetic for his negative situation with his father and proud of him for listening to his conscience instead of the status quo. That, my friends, was the point of Huckleberry Finn's adventures, and it is indeed a good point. Although I have nothing but nice things to say about The Adventures of Huckleberry Finn and genuinely enjoyed it, I cannot necessarily say it is one of my favorites, primarily because I would've liked less time with the Duke and the King. But, it's an important piece of literature that's bound to work its way into any heart; anyone who reads it is bound to appreciate it. 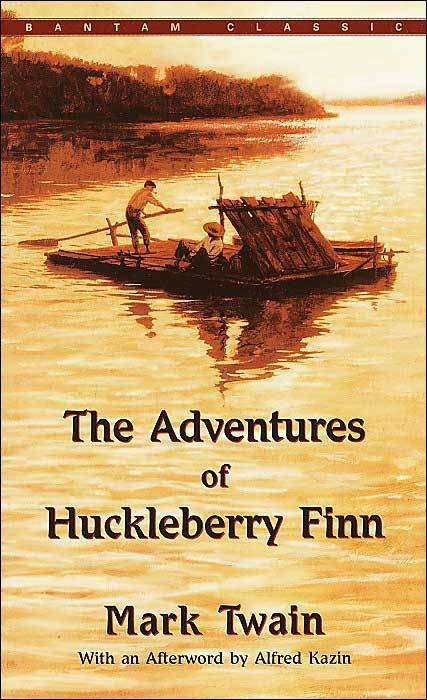 Adventures of Huckleberry Finn is a nice book, I believe. Regardless what feeling it brings or might bring, it is still a literary masterpiece, which influence on children during decades. Sympathy to main hero's negative situation is also a plus, as the book affected you as a reader anyway!